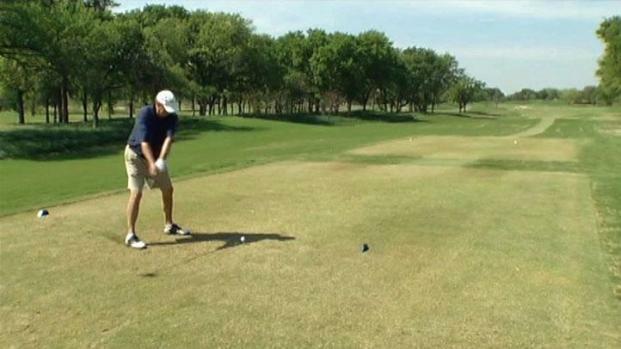 A harsh winter with several days of snow and ice took its toll on North Texas golf courses. One, in particular, the TPC Four Seasons Las Colinas in Irving, has to be ready for the PGA Tour's HP Byron Nelson Championship in less than two months. Saturday was the perfect day for a round of golf, but the turf isn't perfect. "The winter season was a little tough. We had a lot of snow in February. But we're through that. Now that the sun is shining, we seem to be coming out of it very, very well," said John Cunningham, director of golf course operations. Cunningham has replaced a few hundred square feet of Bermuda grass, which is just a small fraction of the golf course. Avid golfers are noticing a slight difference in their game. Ice, snow, and freezing temperatures have left their mark on North Texas golf courses. "[The new grass] is softer. It's not as hard, so when you hit the ball, you don't probably get quite as good of contact with the ball as you usually do on regular grass," said Melanie Awe, of Irving. "You just kind of get used to that. It's just part of the game of playing golf." But the real test will come in May, when the pros hit the fairways. "If we had had some rain, I think it would be in fantastic condition already. I think the lack of some rain has slowed the progress a little bit, but up to this point, it looks exactly like it looks at this point every year," said Rick Besse, of Irving. It may take a few more months before the rest of the grass shows its true colors, as the warm season grass is just starting to grow and replace the cool season grass. The TPC saw about one inch of ice and five inches of snow during more than 10 days of sub-freezing temperatures. The HP Byron Nelson Championship runs May 23-29.